…Instead, her program focuses on addressing the root causes of phone addiction, including the emotional triggers that cause you to reach for your phone in the first place. The point isn’t to get you off the internet, or even off social media — you’re still allowed to use Facebook, Twitter and other social platforms on a desktop or laptop, and there’s no hard-and-fast time limit. It’s simply about unhooking your brain from the harmful routines it has adopted around this particular device, and hooking it to better things. 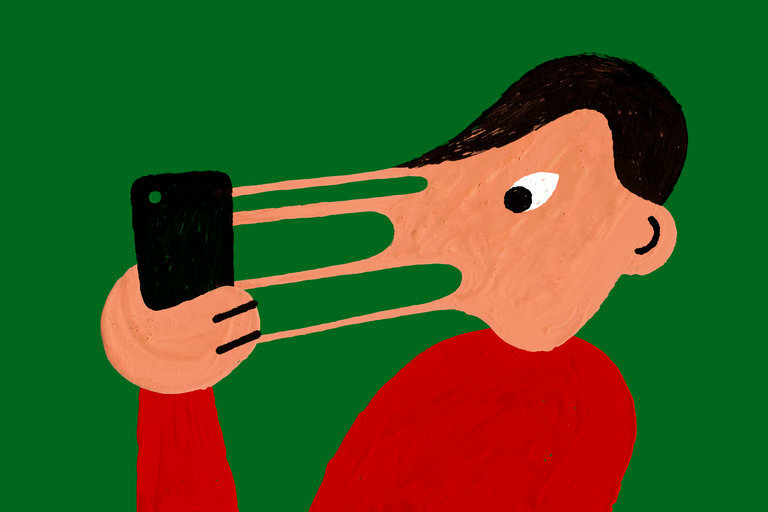 …For the rest of the week, I became acutely aware of the bizarre phone habits I’d developed. I noticed that I reach for my phone every time I brush my teeth or step outside the front door of my apartment building, and that, for some pathological reason, I always check my email during the three-second window between when I insert my credit card into a chip reader at a store and when the card is accepted. I spend more time interacting with it than I do interacting with my children. I am in the presence of the device more than I am in the presence of my wife, although at least I have my priorities straight as to which I go to bed with. As Cal Newport puts it in a new book, Digital Minimalism, we didn’t sign up for this. For this reason I was determined not simply to cut back on my digital activities, but to fill the freed-up time and energy with something else. I focused on three activities. First, more exercise: I replaced Twitter with an exercise app that could run me through some brief, vigorous training sessions. And third, since social media is supposed to be about connecting with far-flung people, and since Christmas was looming, I decided to start writing letters to include with Christmas cards. Silicon Valley parents are increasingly obsessed with keeping their children away from screens. Even a little screen time can be so deeply addictive, some parents believe, that it’s best if a child neither touches nor sees any of these glittering rectangles. These particular parents, after all, deeply understand their allure. One of the most immediate benefits is that, when something terrible happens in the news, I don’t see an endless, repetitive stream of dozens of people reacting to it in succession. It turns out, I don’t mind knowing about current events, but it hurts to see lots of people I care about going through anguish or pain when bad news happens. I want to optimize for being aware, but not emotionally overwhelmed. To that point, I’ve also basically not refollowed any news accounts or “official” corporate accounts. Anything I need to know about major headlines gets surfaced through other channels, or even just other parts of Twitter, so I don’t need to see social media updates from media companies whose entire economic model is predicated on causing me enough stress to click through to their sites. Similarly, I’ve focused a lot more on artists and activists and people who write about the stuff I’m obsessed with in general — Prince or mangoes or urban transit or the like. That brings a lot more joy into my life, and people writing about these other topics offer alot more inspiration for the things I want to be focused on. Oddly, given that my job is being the CEO of a tech company, I follow far fewer people in tech, and almost no tech company accounts except for my own. Despite that, I’ve missed almost nothing significant in the industry since making this change. In recent months, the scale of the erosion of our anonymity has become dauntingly clear. In humming, ice-cooled server farms, the monoliths of Silicon Valley gather fat troves of personal information. This much we have known for years – as early as 2010, an investigation found that Facebook apps were routinely collecting information for internet-tracking companies without our consent – even from private accounts. But the recent Cambridge Analytica scandal brought new clarity. Those who downloaded their personal data files found that Facebook and its associated apps had been tracking phone calls, reading messages and plundering phonebooks. This gleeful, grasping attitude to our data is in the social network’s DNA. This year it was revealed that in 2004, while Facebook was still a university campus website on which male students could rate the attractiveness of female students, its founder, Mark Zuckerberg, sent an instant message to a friend in which he boasted that he had collected more than 4,000 emails, pictures and addresses of people who had signed up to the service. “Dumb fucks,” he added, after a pause. I still wanted to use my phone when it was helpful or fun. But I wanted a new relationship with it — one with better boundaries, and over which I had more control. I spent the next year and a half researching habits, addiction, behavior change, mindfulness and neuroplasticity, and developed a comprehensive strategy for how to “break up” with my phone. The goal wasn’t to never use my phone again; it was to create a sustainable relationship that felt healthy. Two years later, I feel that I’ve succeeded. Here are some of the key things I learned on how to navigate a successful breakup and create a better relationship with your phone.